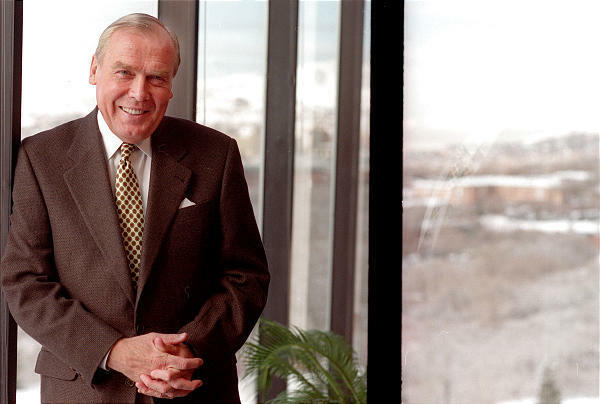 A light lit up Friday at the Huntsman Cancer Institue in honor of its founder, Jon Huntsman. 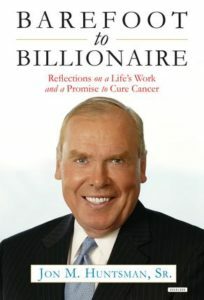 Throughout his life, Jon Huntsman has performed many philanthropic acts. Jon has given to cancer research, universities, and even Armenia. His three passions included finding a cure for cancer, helping the homeless, and promoting education. These passions lead him to his philanthropic acts. He passed away on February 2, 2018, at the age of 80. He has always had a giving heart, giving to people all around the world and in the Church. He led a life full of service. As his family described in an article in The Salt Lake Tribune, he loved chocolate ice cream and Elvis Presley. At the funeral, Jon Huntsman Jr said, “We reflect on a life no single article, no single speech, no tribute could hope to capture. He was too beautifully multifaceted for that.” It was hard for his family to sum him up because there was so much to him. He was so dynamic and he did so much. President M Russel Ballard expressed his sadness about Jon’s passing. He did so much for the Church and its members. President Ballard had Jon’s worn out scriptures that he used in his speech at his funeral. The scriptures were well-loved and showed his devotion to the scriptures, the Church, and God. He served as a member of the Seventy and had a long history of church work within the LDS Church. President Ballard remembers that there weren’t many days when he wasn’t battling a health issue. He suffered from an auto-immune disorder and cancer. Jon had a colorful upbringing and history. He was born in Idaho into a poor family. They moved to California when he was still young so his dad could finish school. He attended Wharton School of the University of Pennsylvania. He married his wife, Karen. In 1959, Jon joined the U.S. Navy as an officer. Jon founded the Huntsman Corporation, a global company that manufactures specialty chemicals, most commonly plastics. He was very involved in politics and served as a consultant to the Office of the President during Nixon’s Presidency. He owned the Salt Lake Tribune, received thirteen honorary doctorate awards from different universities, overcame cancer four different times, wrote an autobiography, and has raised a family of nine and become a grandparent to 56. He has done so much and accomplished so much. Throughout all his life, he has remained close to God and to his family. He will be missed.